Edward Shanahan's Chicago Paranormal Nights tours to explore and experience Chicago historic locations that he has each paranormal night ends with Shanahan performing a séance for those attending. 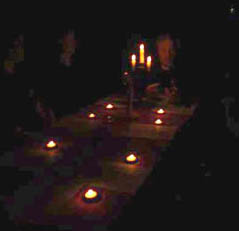 It is not your typical séance where the Medium sits at the end of the table and tells you what spirit is in the room, entered or left the room. Shanahan's goal is to raise the spirits to interact with those attending so that they become the Medium and experience the Spirit World. On Saturday Oct. 16th Andrew Finnigan and his crew from Chicago's very popular KISS FM 103.5 had a Private Chicago Paranormal Night and Séance with Shanahan at The Irish Legend in Willow Springs, IL. The haunted location written about in paranormal books about Chicago. The most recent being Ms. Ursula Bielski's 'Chicago Haunts 3' and she also included pages about Edward Shanahan. Who Is Edward L. Shanahan? Chicago land area and travel. Above photo was taken during 18th Psychometry reading for the day. Edward Shanahan has been gifted the name 'Sun Ray' by a Native American Indian and her Spirit Guides do to his spiritual connection, beliefs & abilities. Edward along with Amy who he has named a 'Psychic Feeler' have documentedtheir 'Feelings' that they have felt at paranormal locations, have been titled 'Spiritual Observers' by the Yahoo Group members of The Unexplained World. Edward was 1st published in 2003, in the book 'Voices From The Chicago Graves' and again in September 2005, his knowledge and feelings about the locations in Willow Springs, IL; - Ashbary Coffee House and Rico D's Pizza Ristorante are published in the book ' Encyclopedia Of Haunted Places '. Both locations are showcased in the 2005 book also includes Amy in the stories, as they describe what she felt at the locations. Two more books that have written about Edward, will come out in 2009. Edward has been written about do to his 'Spiritual Observer' ways in the publication Ghost Magazine and also a Tourist magazine in Illinois. radio show. 2010 also was the start of writing for the Chicago Now web site. to try and prove if spirits do or do not exist. They pick up on the 'feelings of the spirits, energy and the spiritual' of the paranormal locations. Edward has taken it beyond feeling for those who have participated in his 'Circle of Energy', it has become an experience for those who participate. in 2010 with Edward Shanahan being an in studio guest. More people are having Ed Shanahan for Entertaining Psychic House Parties! It is possible to arrange for two Readers (Edward and Annette), for your party. Elegant Parties to Toga Parties or Lounge Entertainment. Details for Edward and Annette together. From Roxanne April 2010 - Edward, You received rave reviews!!!!! Thank you for . much for making it a "fun" reading. With the group of people we had it would not ..
for adding a fun twist to Mom's 70th Birthday! We really enjoyed having you there. Comments from Paranormal Nights are below. Edward Shanahan demonstrating telekinesis with the use of Dowsing Rods. Newspaper Reporter / Editor - Jamie Lynn Ferguson is holding the rods. Now accepting November dates & Holiday party dates for 2010 . . . .
including New Year's Eve and you may consider having two readers. Details for your own Private Paranormal Night at this web page. dear to his heart, including Bachelors Grove, the Humphrey House, the Scutt Mansion, and others. It's a pleasure and honor for me to work with him. and owner of Chicago Haunting Tours. the Historic Haunted Humphrey House in Orland Pk, IL Click Here. . . He starts with doing a Palm Reading and goes as far as even telling the individual if they are an old soul or young soul and explains the difference. to describe the individual and what may be going on with them, includingtheir past, present and future. This is also best for personal answers byway of the One on One Psychometry. attend a location he is doing readings at, bring items of a loved one who has passed away with you. Edward recommends items like rings, watches, glasses etc.. stuff that they would of wore and picked up their energy. Edward will also include a bit of The Masks of Tarot, using Tarot Cardsat the end of the session. Edward at times will venture to cemeteries for those seeking him to do Spiritual Conscious Channeling, at a grave site of a love one who has passed away. knows, that it is also a form of entertainment for some of the curious who attend. My Circle of Energy - The experience for you. In October of 2005 there was a night of back to back "Circle of Energy"demonstrations in an area of sacred Native American land, that was a night that no one will ever forget do to the spirits that responded to Edward's request to show or be felt. 2006 brought an experience during a 'Circle of Energy' Ed held at outdoor area during the day, when requested the spirits to show or provide a sign..The wind started to blow hard, but as everyone experienced, it was coming from the area of the ground below themin the Forest that they were standing on. 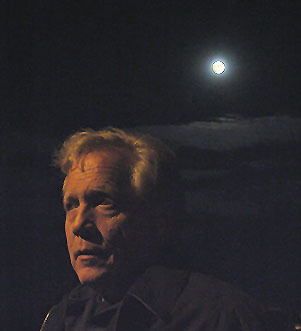 In 2007 at the Historical Haunted House in a S.W. Suburb in the Chicago land area, seen Edward during his " Circle of Energy Seance " start to channel the father / husband spirit in the room that family members of the home were waked in and some of those present experienced the Spirits in the room during the "Circle of Energy ". 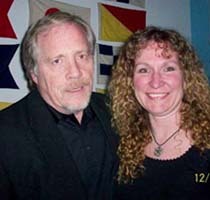 In 2007 Edward was happy to announce that he and Chicago's top Paranormal author Ms. Ursula Bielski, both came together to bring to you, unique paranormal locations and experiences with their creation of " Beyond the Veil ". More details can be found here for " Beyond the Veil "
* Edward is interviewed for the first time. Learn about his beliefs about Healing Miracles, the Paranormal and more in this open interviewof him that was done on The Unexplained World Internet broadcast. Feel free to contact Edward Shanahan below if interested in any of what he offers or join 'The Unexplained World or Spirit Weavers' Yahoo Groups (listed below), to keep posted on different events or locations he will going to and you can participate in the experience. 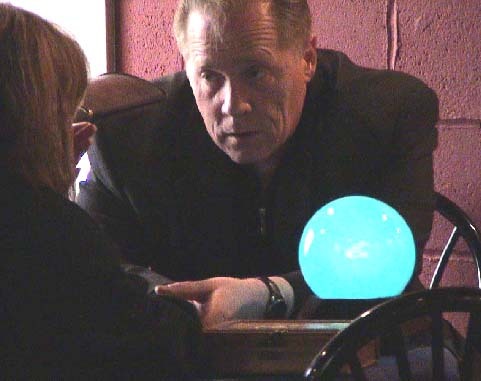 Psychometry is a tool, as are Tarot cards, Runes, stones etc..
Edward Shanahan will also do personal readings for House Parties, CorporateParties / Events and Businesses interested in having him in to do readings fortheir customers. Also does readings in ' The Round ' for an entertaining groupreading. It is also possibly for him to travel out of state for those interested. Is the Paranormal something that you seek answers about? Haunts You? of locations in the Chicagoland area that he has experienced and spoken of on his web site below? Or would you enjoy participating in one of the paranormal outings? Or a night of entertaining Conscious Channeling and readings for a group of people or just a select few at a location of you choice or your home ? Dates and locations with Ed Shanahan and Historical Societies. Haunted Historic Locations with Historical Societies. the Paranormal Outings and Psychic Fairs - Join one of the Yahoo groups below. The Unexplained World with over 1,700 members. 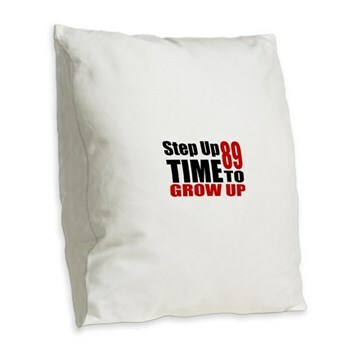 For those of all spiritual beliefs and home for those with premonitions, psychic & intuitive feelers. Readings for entertainment and answers possibly within you to your personal questions. All life decisions are solely the responsibility of the participant. The purpose is to give a view of life. There are no guarantees or liabilities. Spiritual Psychometry (Conscious Channeling), at times may not be successful, but has nothing to do with the individual requesting it or the love one that has passed away. Channeling is not an exact science & is subject to human interpretation. They are there waiting for you! Spirits - are they testing us? in the Orland Park Prairie newspaper. Edward's Upcoming Paranormal and Psychic Fair Dates. feel free to ask to read it if you should happen to be at a location he is at. May your heart always be loved and able to love. 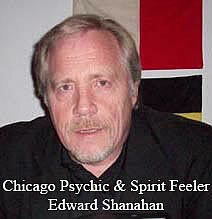 Edward Shanahan out of Chicago, is known as a Psychic Spiritual Feeler, using energy felt by him. A believer in the Paranormal, Supernatural, Ghosts, haunted locations and the fact the spirit world wants the living world to know that there is a spiritual side. Shanahan uses this and his Internal Knowledge to attempt to tap into the spiritual side, if requested to read items of loved ones who have passed away with his readings, or at haunted locations with what he calls his Circle of Energy. Individuals from the Midwest have traveled to part take in the Psychic readings, haunted locations and more. Travelers have come from the states of MI, WI, OH, IN, Kentucky to participate and be entertained. Shanahan also dose private house party readings to entertain your guests and if requested by the host of the party, it could be possible to have two Psychics. Also does private ghost tours for groups of friends, corporations etc, e-mail him for details.